Neath coach Patrick Horgan says the Welsh Rugby Union should expand the Principality Premiership to 14 teams and have no relegation. 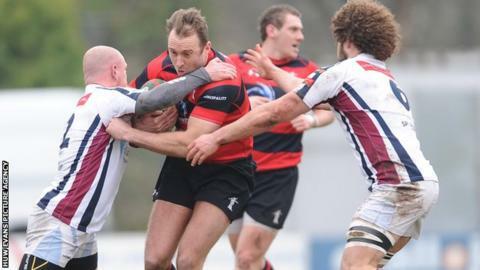 Neath secured their Premiership place with a 27-10 win against Aberavon at the Talbot Athletic on Monday. Aberavon and Swansea go into the final weekend of the season battling it out for Premiership survival. "My personal belief is that I wouldn't want to seen anyone relegated," said Horgan. "I think Swansea have far too much to offer the Premiership, the Ospreys and Welsh rugby to be down in the Championship. "I also feel Aberavon have too much to offer as well, because they are still in the [relegation] battle. "I wouldn't like to see anyone go down to be totally truthful." Ebbw Vale will be promoted after winning the Championship, taking their place in Welsh rugby's second tier after a four-year absence. Horgan said: "I think the Premiership can be big enough for two sides to come up. Ebbw Vale definitely deserve to be in the Premiership, there is no doubt about that. "My view is that the Union should make a decision on another team perhaps. "I would like to see another two teams come into it, another two home games and more revenue for the clubs. "I don't think it would have a detrimental impact on the standard of the Premiership at all, if more teams came up. "Putting a team like Swansea or Aberavon down just doesn't make sense." Swansea host Neath at St Helens on Saturday. 26 April, while Aberavon host Carmarthen Quins on the same day. Ebbw Vale, who have remain undefeated at home for a second season, are the winners of Swalec Championships for a second time and are set to be promoted.